Beat the crowds to Alcatraz, and experience San Francisco aboard an authentic cable car with a modern twist. 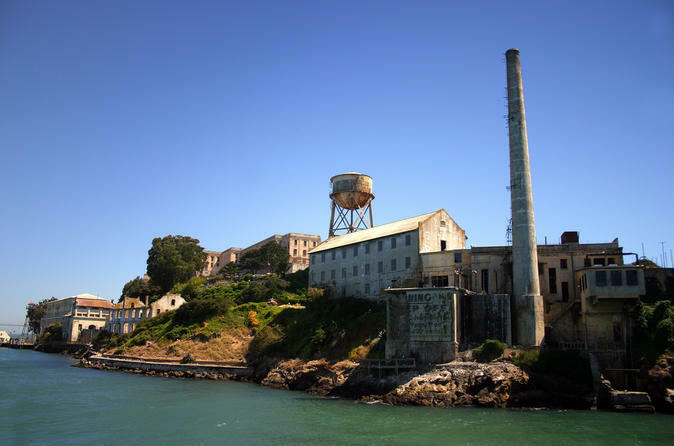 This exclusive tour puts you on one of the first ferries to Alcatraz Island for priority entrance to this famous attraction, and includes the award-winning audio tour. Then on the city sightseeing tour, explore all the sights of San Francisco with stops at the Golden Gate Bridge, Fort Point, and the Palace of Fine Arts from aboard Hornblower's Classic Cable Car. This wheeled vehicle lets you be part of a historic age-old tradition while enjoying the mobility of a modern vehicle, so you can see more of the city. This exclusive Viator tour can’t be booked anywhere else! This exclusive Viator VIP experience in San Francisco combines one of the city’s top attractions, Alcatraz, with a city tour of famous neighborhoods, landmarks and sights on board a Hornblower's Classic Cable Car. You will start the tour in the early morning at Pier 33, where you will meet your tour guide. After checking in with us, enjoy a light snack as you make your way to Alcatraz Island aboard an early ferry to Alcatraz. This priority ferry provides admission to the island prison before most other visitors are allowed, so you can enjoy your experience without the jam-packed crowds. When you arrive, independently tour the cellblock and other areas using the award-winning audio guide that includes commentary from former inmates and guards. Learn what life was like inside the jail cells of notorious criminals like Al Capone. Palace of Fine Arts is an architectural treasure dating back to the 1915 Panama-Pacific Exposition. Disembark at the monumental structure for a close-up look of it's art and architecture, and snap photos of the city treasure with swans in the foreground. The world famous Golden Gate Bridge speaks for itself. It is, plainly put, an engineering marvel built across San Francisco Bay in 1937. You will get a chance to step foot onto the grand suspension bridge, and listen to stories of its art deco structure from your tour guide. The National Historic Site at Fort Point offers a close-up vantage point of the Golden Gate Bridge. Get a front row seat to where the Pacific Ocean and Gulf of Farallones meets San Francisco's Bay at this amazing location underneath the Golden Gate Bridge. Learn about the fort's rich military significance and maritime history. In addition to these sights, the Alcatraz VIP Early Access & Cable Car Sightseeing Tour includes notable sights such as Ghirardelli Square, Crissy Field, and Presidio National Park. Cruise up and down the hills of San Francisco to admire views of Victorian homes. Traverse Pacific Heights, and take advantage of some great photo opportunitiess as you pass by the home featured in the blockbuster film Mrs. Doubtfire. Pass through North Beach and Chinatown. See everything that matter on Hornblower's Alcatraz VIP Early Access & Cable Car Sightseeing Tour.